Dmitry Samarov is an artist and writer who lives and works in Chicago. After graduating from the School of the Art Institute of Chicago in 1993, Dmitry drove cabs for twelve years. He captured his years as a taxi driver in the stories and art of his first book Hack, which was released last year from the University of Chicago Press. Hack also exists as a blog where Dmitry continues to share his stories. 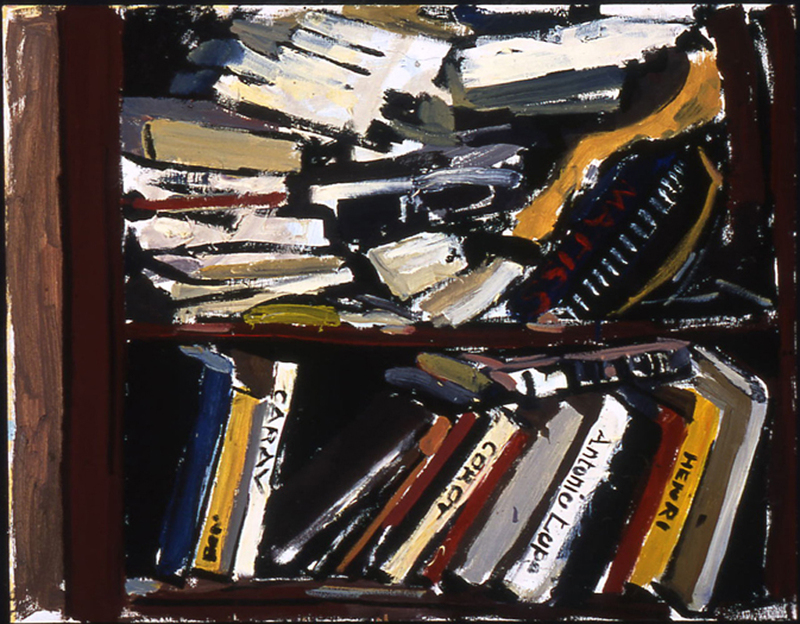 I first became aware of Dmitry’s work via Twitter; I’d been posting images of readers and books for the past year—one a day—and was thrilled to find his series of bookshelf paintings and his figure paintings. Dmitry was kind enough to talk with me over a series of emails about his art, his writing, and why you’re not likely to see any space vampire paintings from him anytime soon. You can see more of his work at his website—or better yet, check out one of his upcoming shows if you can: “Dmitry Samarov: Bookshelf Paintings” opens January 11th, 2013, at the Harold Washington Library in downtown Chicago, and “Pictures from a Chicago Cab” opens at the University of Central Missouri on January 23rd. Biblioklept: Why do you paint? Dmitry Samarov: Making pictures is how I talk to the world. I can’t remember ever not doing it. I got in trouble for doodling in 1st Grade back in the Soviet Union and haven’t looked back since. Trying to catch a bit of the way the light changes as the day wears on or the manner in which a girl looks inward as she reads a book or how paperbacks and hardcovers on a shelf lean on each other, all these small moments and many others have occupied my time. Making marks on a surface is a way to record my time here and to show others what I saw. When I do it right they’re able to see something of what they know in my pictures. Writing about painting is always ultimately futile—the reason one paints something is because he can’t say it and probably vice versa too—but we just can’t seem to help it, can we? Biblioklept: You bring up your paintings of book shelves and readers—I’m particularly interested in these. Can you talk about how you approach painting figures who are reading? What’s your process? How is painting a reading figure different from a portrait where the figure gazes at the viewer? DM: I’ve never liked posing sitters. When I paint portraits or figures they are usually friends or family rather than protagonists in a narrative I have in mind, so I like them to choose what they’re doing. If you’re gonna be sitting for an hour or two what’s more natural than to read a book? There aren’t many people who are able to just sit for long periods and when they do it creates a tension. You can see it in Lucian Freud’s great portraits, those people are weary from sitting in his dingy, gray studio. I prefer to paint people in repose—not to the point of pretending that they’re not being looked at—but neither like a bug being examined under glass. Readers are wrapped up in their own inner state rather than working to express some message an artist might be trying to impose. This is as close as I know how to portray a person as they are rather than as I’d like them to be. Biblioklept: So then, for the most part, I’m guessing you don’t photograph the subject and work from that photograph to create the painting. How does painting the sitter “live” (for lack of a better term—if there is one, please let me know!) differ from working from something like a photograph? DM: I always prefer to work from life. 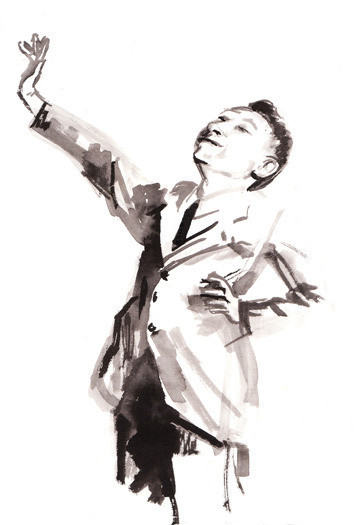 The only things that are from photographs, sketches, or memory are my illustrations and some commissioned pieces. What’s always interested me is looking out at the world and making marks in reaction to what I see. Working from photographs doesn’t allow me to do that. They’re frozen and unnatural. Life never stops the way it does in a photograph. A drawing or painting can acknowledge the passage of time, the light changing, and many other things much better. But, of course, I’m very biased about this. To me a picture should be a collection of many moments. It’s made in the space between the subject and the artist’s eyes and mind. It’s a conversation, a back-and-forth. I can’t have that same conversation with a photograph or even with one of my own memories for that matter. 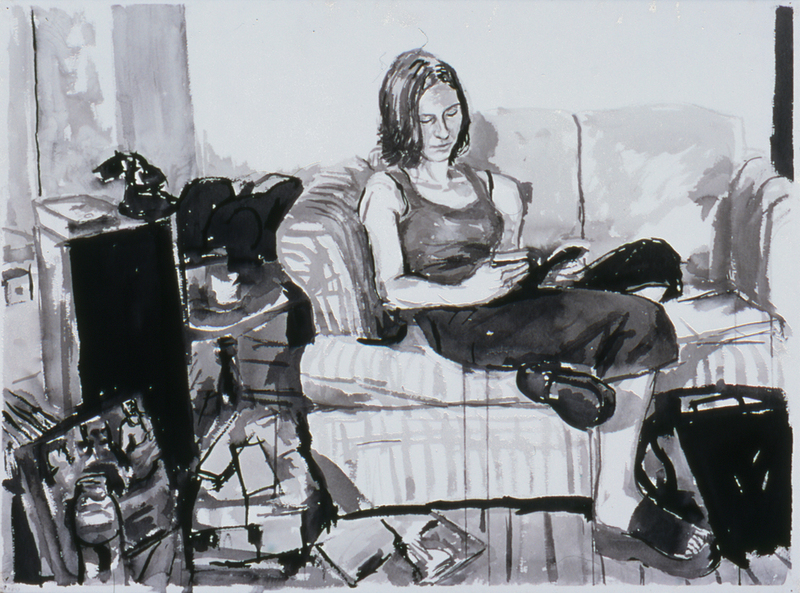 Biblioklept: I think your paintings show the energy of that conversation. Can you talk a bit about your book paintings? 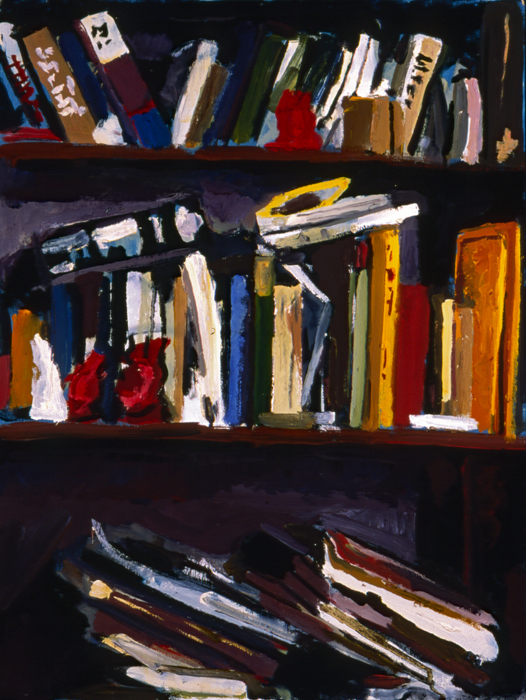 When did you start painting images of book shelves? Are the shelves your own? DM: I started doing the book paintings about fifteen years ago and return to them every few years. I think I was looking for a way to do still-life without setting anything up. I like the way the books lean against each other, the crevices formed in the gaps between them, and the way the overall structure and character of a shelf changes over time as books are removed and replaced. It’s also always been funny to me to be painting the outsides of books so much of what a book is is contained between the covers. The shallow space of a bookshelf also offers a different kind of challenge than the kind of vantage points I usually gravitate to. At times it becomes an almost abstract arrangement of shapes. Despite all that, these are my bookshelves and I have read most of these books. It’s just one more way to engage with them and who wouldn’t want that? Biblioklept: I’ve tried to photograph all of my bookshelves this year as part of a project on the site and it’s turned out to be much more difficult than I imagined—the way the light hits differently textured covers, and so on. Since we’ve been talking about books and paintings of books and readers, I’m curious about paintings that you love (or hate) of readers and books—are there any particular paintings that come to mind? DM: I like a lot of the 19th Century trompe l’oeil paintings by Harnett, Peto, et al. There’s a new thing lately of painting bookshelves with every title clearly visible. I think it’s a kind of showing-off, of letting people know how learned or in-the-know you are. I’m not a fan of that. I use text in some of my paintings but it’s often for visual reasons, if the color of the lettering on a particular spine contrasts in an interesting way with the book next to it, say, I may emphasize that. It’s always in the service of the entire picture rather than some sort of status report. Also the hand-painted Penguin paperback covers. : cute but pretty quickly forgettable. Biblioklept: Let’s talk about the intersection of your writing and your illustration. First, I’m curious about Hack. The University of Chicago Press put out a collection of your stories (with illustrations) under that name last year, but you also have earlier versions of Hack in old school zine form, as well as a blog that features new writing. I’m curious how you think of Hack—do you think of it as an ongoing project? A book? A blog? A persona even? DM: Hack started as a zine around 2000 as a way for me to make sense of my three years driving a cab in Boston (1993-1997). It was called Hack because the license to operate a taxi in Boston was called a Hackney Carriage License and they used to call cabbies hacks in the old days. It was my first attempt at writing outside of school homework assignments and there really wasn’t much writing, it was mostly pictures. Those pictures were a challenge too because, as I’ve said, I work primarily from direct observation and the only way to do these were from memory. These illustrations were made to work together with the words, not to stand on their own and that has continued to be the case through the whole history of Hack. I started driving a taxi in Chicago in 2003 and revived Hack as a blog late in 2006. To my surprise, it got notice pretty quickly from some in the local press—Whet Moser, then of the Chicago Reader especially—-and my high school pal John Hodgman mentioning it in a magazine didn’t hurt either. That got it noticed by a publicist at University of Chicago Press named Levi Stahl. He bought a copy of my self-published compilation (see the third one down) and eventually pitched Hack as a book to his employers. They published it in October 2011. I stopped driving last summer and spent a couple of months putting together a second book. It’s all ready to go. I’m just waiting for a publisher to snap it up. The new one expands on a lot of the themes of the first book and spans my entire cab career, from 1993 to 2012. I’m a much better writer from having gone through the editing process on the first book and from the sheer amount of writing in various venues that I’ve done over the last few years. I don’t know that Hack is/was a persona but it’s certainly gotten me more attention than anything else I’ve done. Biblioklept: When you were working on the pieces for Hack, did you start with the illustrations or the words? DM: The illustrations were always first. They were my way into the writing. I went over the phrases I’d use as I was working on the pictures. That’s the way it goes to this day for the most part. I always have been and always will be a painter first. Biblioklept: The pieces of Hack I’ve read seem to channel the stories of your passengers—there’s a lucid straightforwardness about them that I like. How conscientious of style are you when you’re writing? How much do you edit? DM: I edit a lot. I use as few words as possible. It’s evolved over time of course. When I started I leaned really heavily on ellipses as a transitional device. I cribbed that from Celine’s Death on the Installment Plan. Editing the entries for the first book cured me of that. In general the cab stories take their inspiration from Nelson Algren’s advice to just go out into the streets and listen to the way people speak and to write that down as simply as possible. At it’s best my writing tries to do what my painting does: to relay what I see and here out in the world. I try my best to stay out of the way because everything out there is so much more interesting than anything I could ever dream up. Biblioklept: You know, I almost referenced Celine in my last question, because the ellipses are clearly a major stylistic device in your self-published version of Hack (and also because I dig your painting Celine). You bring up Algren—what other writers do you admire? DM: Algren is a real touchstone because he introduced me to Chicago a few years before I even arrived here in 1990 to attend the School of the Art Institute. There are many others. I love Joseph Mitchell’s Up in the Old Hotel and Luc Sante’s Kill All Your Darlings as models for ways of writing different sorts of personal essays. William Gaddis’s books, especially JR, for the way he captures American speech and Cormac McCarthy, especially Suttree, for descriptions of physical environment. Lately I’ve been looking into forgotten local authors a lot and writing about them at Writers No One Reads. A sense of specific place is very important to me. I don’t have any aspirations to write fiction but usually, as long as it’s rooted in reality, I’ll probably read it. Biblioklept: You’ve returned to the idea of reality a few times in our conversation, and your paintings and illustrations seem to evoke a strong sense of place. Why is depicting real scenes important to you? I’m guessing we won’t see a series of space vampires from Dmitry Samarov anytime soon . . .
DM: Writers and painters who use space vampires, fantastic worlds, etc. probably just have more imagination than me. Or perhaps the everyday world doesn’t provide them with enough inspiration or subject-matter to say what they need to say. I don’t have that problem. For me just looking out the window for a moment as I type this gives a glimpse of a thousand paintings I could try to paint. What’s out there is within my scope of vision is as limitless as outer space must be to sci-fi writer or a dream must be to a fantasist. The few times I’ve tried to resort to my imagination I’ve found it at once limiting, hopelessly random, and sadly wanting. How could I choose one thing rather than another and what would it matter? There are still many choices to be made when working from what’s before me but it doesn’t feel random and meaningless in the same way. It’s more that I’m pushing against something that’s actually there and it’s pushing back at me. But maybe I’ll switch to space vampires after I get bored with reality. 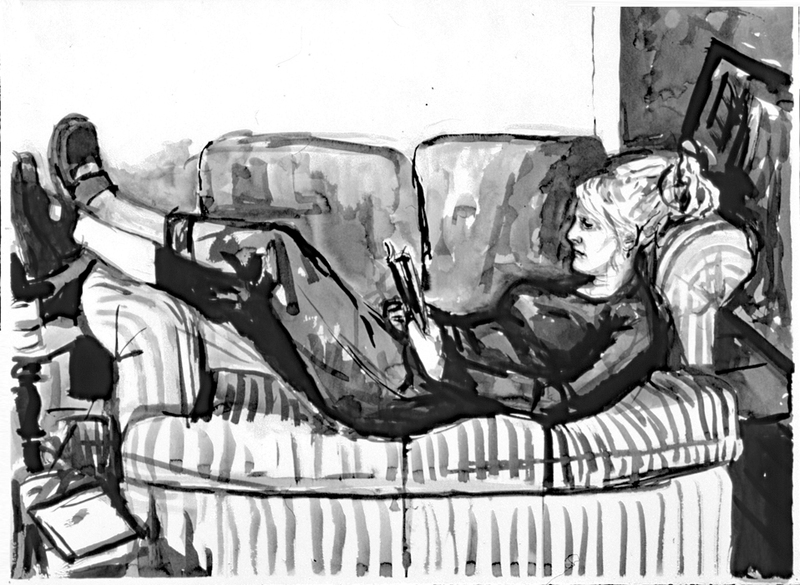 Biblioklept: Do you paint or draw every day? Do you write every day? DM: I try to paint, draw, or write something most days. It’s a much better day when I have than when I haven’t, that’s for sure. The internet has made it possible to share every stray scrap that one comes up with and I’m probably guilty of putting too much out there for others to see, but I’ve always thought of all my work as being public, that part that’s for me is just the doing. After I’m done, it has to sink or swim on its own and for that viewers and readers are needed. The internet is like a big messy studio where (hopefully) over time all the false starts and failures will be forgotten, ignored, or swept away and the worthwhile things will have whatever life they deserve. What I’m trying to say is that most of hat I do is probably crap but that maybe there’s some value in sharing it with others and letting them judge rather than holding things close and only showing them the ones that I’m convinced are good. In any case it’s nearly impossible to say right after finishing a picture whether it’ll speak to people or is just a rehash of something done before or a waste of time I’ve somehow convinced myself to push on with. I hope in twenty or thirty years to look back and be able to say that I’ve made a couple of things that were worthwhile. Biblioklept: So do you find it hard to judge or evaluate your own work? DM: Not at the time I’m doing it. I throw away plenty. But with the benefit of, say, a year or five or ten, things I thought weren’t bad turn out to look awful and occasionally, vice versa. As a rule though, I think once I’ve decided to let something out into the world it’s no longer my job to evaluate it. If I thought enough of it not to burn or paint over it it has to try to survive on its own steam. Biblioklept: What are you working on right now? DM: Well, I finished a second book of illustrated cab stories. It’s called WHERE TO? More Stories from a Hack and covers from when I first drove in Boston in 1993 until the summer of 2012 when I gave my last cab ride. It goes deeper into the inner workings of the cab industry, the people who take cabs, attempts to answer why I decided to drive a cab in the first place. I’m still looking for a publisher for it. I’ve been writing and illustrating occasional baseball-related pieces for Chicago Side’s sports section, working on illustrations for various other projects, and finishing up my first book review for the Chicago Tribune’s literary supplement, Printers Row, on a recently-reissued forgotten novel called Diversey. Also I have two art shows coming up in January and another in February. 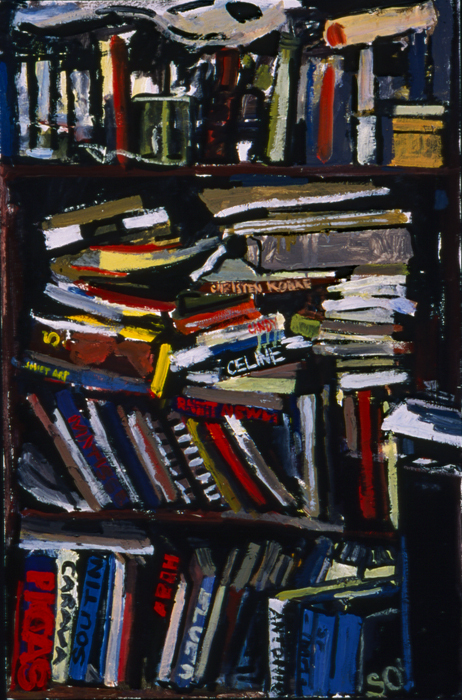 On January 11th, “Dmitry Samarov: Bookshelf Paintings” opens at the Harold Washington Library in downtown Chicago. 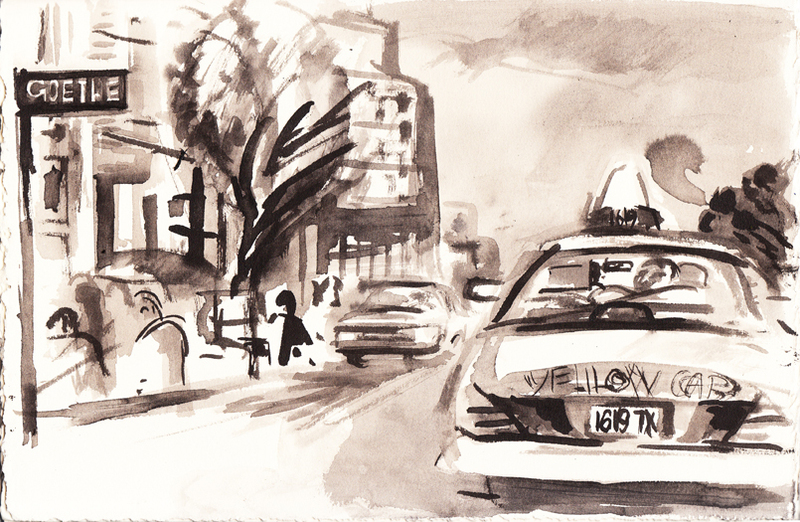 On January 23rd, “Pictures from a Chicago Cab” opens at the University of Central Missouri. All that and doing my best not to have to go back to a day-job. I haven’t driven a cab in about five-and-a-half months and have really gotten to love not having to leave the house much. DM: I used to steal ’em all the time. I had a good scam going when I was school changing price-tags on expensive art books, getting $100 ones for $20 and such. I used to steal a lot of things. I wrote a whole thing about it for The Handshake. Biblioklept: Can you talk about a particular book you remember stealing? DM: I stole this beautiful Giacometti book from Powell’s sometime in the early-90s and wound up having to sell it at Myopic Books in the late-90s for much less than it was worth when I was broke and between jobs. I’ve sold off tons of great books and records over the years. I’m neither the most careful collector nor blessed with much foresight as to what might or might not be valuable in the future.